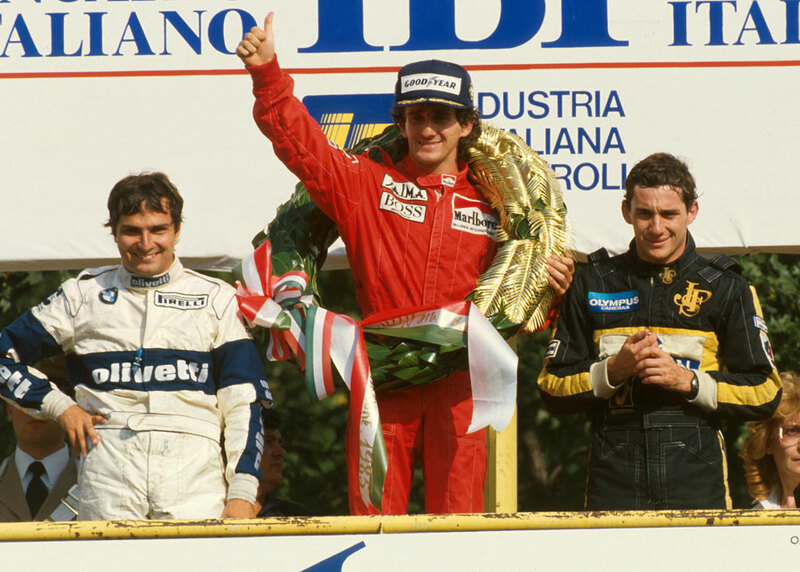 Alain Prost's fifth win of the season at Monza - the 50th Italian Grand Prix at the iconic venue - gave him a commanding 12-point lead in the drivers' championship. Although this was his last win of the year, so markedly did Michele Alboreto, his nearest rival, fall away that he was never under any real pressure after this race. Even though there were five rounds, including this one, to go, Niki Lauda's announced retirement had caused an early start to the annual drivers' team switches for 1986. On the eve of Monza Nelson Piquet announced he was leaving Brabham to join Williams, replacing Keke Rosberg who was moving into Lauda's vacated seat. Phillippe Streiff was racing for Ligier for different reasons after Angelo de Cesaris was fired after making one error too many. But there were sadder reasons for Tyrrell only entering one car. A week earlier Stefan Bellof had been killed in a sportscar event at Spa and with his funeral set for the day after the grand prix it was felt inappropriate to replace him. Ayrton Senna secured his fifth pole of the season and he went head-to-head with Rosberg into the first corner, for once the fearless Senna backing off as Rosberg held his line, hitting the kerb as he checked his Lotus. That error allowed Nigel Mansell into second and Prost third. Mansell was soon in the pits with an electrical glitch which was cured but cost him two laps and ended his challenge. Rosberg led Prost by seven seconds but he had to pit after 28 laps and that allowed Prost into the lead. McLaren decided to run to the end of the race on the same set of tyres and it was inevitable when Rosberg, on his fresh tyres, regained the lead on the 40th lap. But five laps later and Rosberg's day ended when his Honda engine suffered a broken head gasket, allowing Prost an easy run to the flag from Piquet with Senna, who raced well after his turn one skirmish, in third. Prost made another small piece of history when he became the last F1 grand prix winner to be garlanded with a laurel wreath on the podium. Stefan Johansson gave the local fans their only high of the weekend with his fifth-place finish in his Ferrari. Alboreto was lying fifth when his engine died six laps from the finish. Another world champion was making a return to action, Alan Jones surprising many with his return for the new Lola team. His race lasted six laps before he retired with engine failure. It was to be eight more grands prix before he managed to take his car the distance.